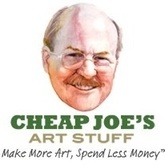 Cheap Joes Art Stuff is a Artists materials & supplies, Craft Shops, and supplies, School supplies and Equipment retail, Crafts and Hobby supplies, Art dealers and supplies, Craft Supplies & School & Educational Supplies and equipment Retail. It also offers Art & Artist Supplies, Industrial supplies, Industrial services and Schools. It was established in the year 1994 in North Carolina. Joseph Miller is the Senior Vice President and Joe C Miller is the President. The company specialized in museums and art galleries, stationery and office supplies. The company offers discounted price on quality art supplies in daily discount deals on many fine artist materials online, by mail or phone. There are currently 0 consumer reviews about Cheap Joes Art Stuff available. Share your review. Please take a note that you are about to post a public review about Cheap Joes Art Stuff corporate office on CorporateOffice.com. This review will be public, so please do not post any of your personal information on this website. If you would like to contact the corporate offices of Cheap Joes Art Stuff, please use their contact information such as their phone number, website, and address listed above to contact them. However, sometimes staff from Cheap Joes Art Stuff headquarters do read the reviews on this website.